On completion professionals will be able to administer, interpret and deeply understand and be able to teach and apply the DISCS four-quadrant model in their managing, coaching, training, or study programs. Once qualified each participant will be able to coach and interpret profiles with proficiency. Access to Dr Tony Alessandra's DISC Virtual Online Training for 30 days. Access to Dr Tony Alessandra's Online Interactive Communication Coach. 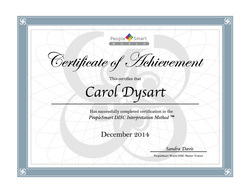 1 Live Q&A Webinar call with Carol Dysart, DISC Master for PeopleSmart World or a qualified instructor. Keys to Understanding DISC online study Questionnaire. Assignments for proof of interpretation, application and insights. Certificate on successful submission and passing of Assignments - A, B, or C pass. 90 day access to the PeopleSmartWorld.com Practitioner's member resource pages. The history of DISC and who first developed it. What observable behavior is and how it relates to our personality. The DISC four quadrant model. The different four “P’ focuses of DISC – Problems, People, Pace & Procedures. Geier’s principals of motivation and how these relate to DISC. Commonly asked questions that often come up about DISC. The Golden Rule – Do unto others, as you would have them do unto you. The Platinum Rule – Do unto others the way THEY would like being done unto. How to support someone that would like to alter or change a behavior. How to look for and debrief two conflicting styles in a DISC report. The philosophy and thinking at the source of the DISC methodology (DISCology). The Beingness Quotient (BQ) technology - how DISC fits within its framework – plus the context and philosophy behind it. The DISC model and what it includes. Key differences in the four DISC dimensions. What the needs, motivators and fears are that drive each DISC style. Overview of the full DISCstyles Profile report. How to read and interpret a DISC graph. How to apply the Word Sketch Chart in your DISC profile interpretation. What a person’s “blind spots” might be and how to reduce them. Why knowing the “fear” of each style can help remove self-doubt. Interpret your own DISC graph and explain each dimension's Focus, Emotions, Needs, and Fears. Describe and understand your own style using observable behavioral language and examples. Recognize the motivated needs of other people's styles. Teach others what their style communicates to others. "People Read" styles well enough to anticipate the needs that drive and motivate each style. Coach others in becoming more behaviorally flexible. Apply the DISC model and its insights into human behavior in many different personal and business applications. Graeme Hogan, one of our certification graduates says the following about his training experience with PeopleSmart World... I found the DISC training through People Smart World very helpful and very thorough. The on line resources meant you could progress at your own pace, going back to check or explore areas that you needed further understanding on and working on it at times that suited you (for me during the Christmas Holiday period). ​The bite sized nature of each tutorials meant you couldn’t get overwhelmed with content, enhancing the ability to take on the material. Having ‘face time’ with Sandra through the process also provided the ability to ‘check in’ on areas you may have needed clarification on. The work books and e-resources also provided great reference material to use in support of the on line tutorials . ​All in all a great way to learn more about DISC in a well-supported way!